When Yana was six, living in Damascus, Syria, her school was destroyed in an aerial bombardment. Since then, she had been out of education. 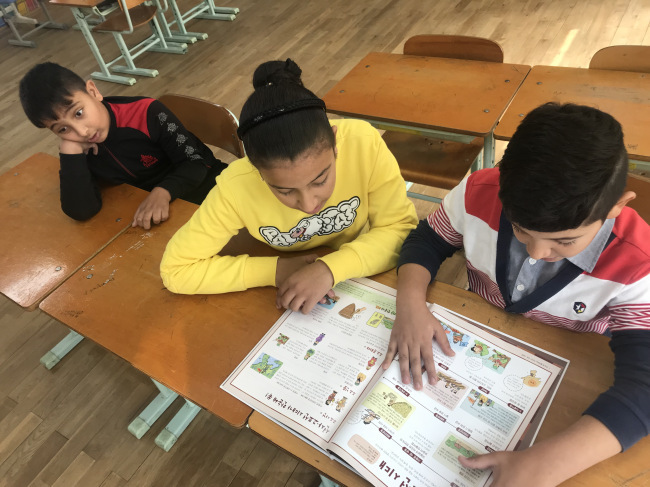 Now 12 years old and resettled in South Korea, Yana said she wants to study more and become an interpreter here in the future -- an opportunity that seemed out of reach in Syria where a 6-year civil war has left many children and youth without an education. “In Syria, I was kept away from school for my own safety. But here, I get to learn three different languages, including Korean. I also get to enjoy lots of cultural activities, like going to museums, and learn new things every day,” Yana said in perfect Korean during at Daehwa Elementary School in Daejeon. “I think girls, too, should get more education. They usually get married young and drop out of class in my country,” Yana said, bubbly and cheerful. Her two younger brothers, Sadeed, 9 and Bakri, 8, also attending the same school, said they wish not to go back to Syria. A huge fan of Psy and BTS -- two of the biggest names in K-pop -- Sadeed said he wants to “become a singer like Psy” when he grows up, and get famous here. 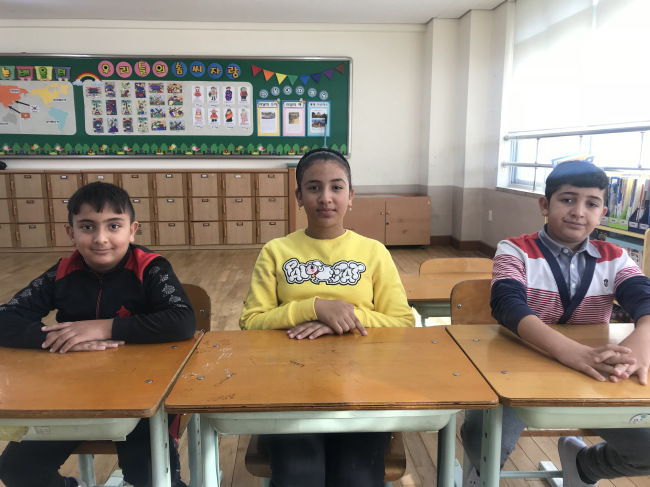 The three learn fast and get along with friends well as they show lots of interest in school work and the new culture, said their guiding teacher Park Jung-eun. “Adapting to school life in a new environment is hard for anyone, let alone students who have fled war at home,” Park said. Erupted in March 2011, the Syrian civil conflict is globally recognized as the largest refugee and displacement crisis of the modern era. Over 5 million Syrians have fled their country as refugees, over 6 million displaced within the country, while hundreds of thousands have died. Yana’s family arrived in South Korea in April 2016. She couldn’t remember details about the path her family took or the year they fled Syria, except that they came via China. Since 2013, a total of 1,160 Syrians sought asylum here, applying for the refugee status and protection. As of September this year, only four of them are recognized as refugees. And they are not Yana’s family. Her parents are “humanitarian-status holders,” like nearly 1,100 other Syrians who have fled here. Recognized refugees are entitled to stay permanently here and the same social security benefits as South Korean nationals. Humanitarian status holders are allowed to stay for just one year, renewable multiple times, and not entitled to any welfare benefits. But, the future is a big question mark. Will they be allowed to stay in South Korea and continue to pursue their dreams even after the war ends in Syria? The response from the ministry official was that humanitarian status holders can stay here by renewing the one-year stay permit, “as long as there are reasonable grounds to believe that their life or basic rights are to be threatened” back home. “So many refugees looking for asylum here are denied refugee status by the Korean government,” said Kim Sung-in, secretary-general of the nonprofit Center for Refugee Rights. He called for an overhaul of the country’s tough refugee policy based on the Refugee Act. In a written response to a question why so few are given refugee status, the justice ministry said they review individual cases thoroughly. To be sure, the parents’ legal status does not affect Yana’s and her brothers’ access to education right now. In South Korea, primary and middle school education is compulsory and free for all, regardless one’s visa status. Children of illegal immigrants are provided with the same education opportunities. But, not every refugee child fits into the public school system as successfully as they did. 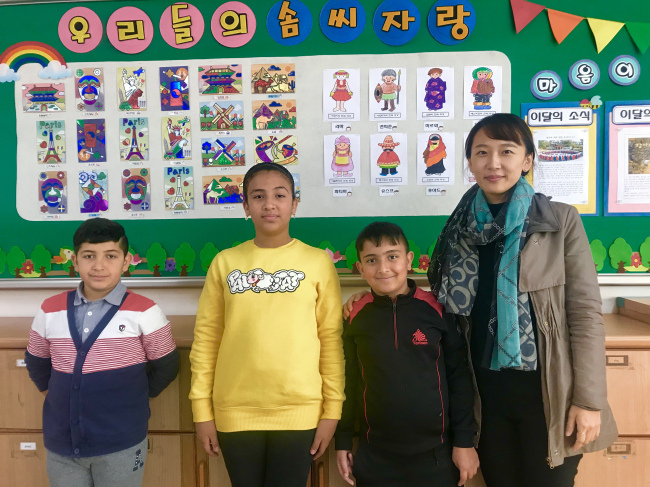 Before joining regular classes, Yana and her brothers had a six-month adjustment period, undergoing a special program designed to help foreign students with limited or no Korean language skills. Their school -- Daehwa Elementary School -- is one of 165 schools nationwide designated by the Education Ministry that run the 6-month preparatory course for foreign students, including those from immigrant and refugee families, along with regular curriculum for local students. A total of 179 classes are being run under this program, but due to the ever-growing number of students needing it, they are already overcrowded, with up to 50 students in one class, according to the ministry. Still those are the lucky ones. Many start right away with regular classes at regular schools that have very few, if not any, language and cultural programs for them. Regarding the lack of educational support, Oh Shin-jong, the director at the multicultural education division of the Education Ministry, said it is “practically impossible” to run Korean language and culture classes at all schools. The government instead provides part-time Korean language teachers for refugee and immigrant students who have to attend regular schools upon entering the country. The government also matches them with local college volunteers through a mentoring program, he added. Data on the number of students with refugee or humanitarian holder statuses was not available. Together with immigrants and children of temporary foreign residents, there are about 20,000 foreign students attending school here, the ministry said. “More government support is needed as regular school can’t afford to run Korean culture and language programs for refugee and immigrant students because of the tight budget. Other problems include that those schools usually have a low level of understanding of how to teach diversified classrooms,” said Jung Yun-sung, vice-principal at another multicultural public school Incheon Hannuri School. “These student often ends up not pursuing education, because their parents struggle to make a living and can’t afford to provide further education for them,” he said. For Yana, school seemed so much fun, but there was one thing that she was not happy with -- the lack of halal options in school meals or snack stalls near school. “I eat alone at lunch because I’m not supposed to eat most of the menu in the school meal,” she said. Yana, Sadeed and Bakri are not their real names. The names were changed on request. –Ed.